"A simple and understated sleeper sofa with a variety of fabric options." “Built with a corner-blocked wood frame, tight back, and foam seat cushions." “This sleeper sofa pulls out to a queen-sized bi-fold innerspring mattress." “Its smaller footprint is ideal for studio apartments, smaller living rooms, and dens." “The super-versatile, classic design will hold up well over time." This understated sleeper sofa will be the perfect addition to your living space. It comes in 131 different color options from beige to bright red. You can also choose from eight different fabrics: acrylic, microfiber, cotton-blend, Sunbrella, polyester-blend, Polypropylene/olefin, polyester, and cotton. No matter which color and fabric you choose, the clean lines and piped details will look modern and fresh. The Sarah Sleeper Sofa features a full-sized bed frame that you can pull out when you have overnight guests. It's made of Brazilian hardwood, so it will hold up with repeated use, and the foam filling is comfortable to sit on. The sleeper sofa measures 72'' x 60'' x 6.5'' and weighs about 180 pounds. If you're looking for a contemporary (and affordable) piece to add to your home, this is a great option. With its tailored, timeless design, clean lines and eco-friendly production, this sleeper sofa from Red Barrel Studio makes the perfect addition to any style of living room—and the ideal place for guests to crash overnight. Make this sleeper your own by adding decorative pillows or throws; it’s neutral, polyester upholstery makes it ultra-versatile. Its solid, hardwood frame is wrapped with eco-friendly cushions made from polygon, a derivative of soy beans and castor beans. Plus, the entire sofa is formaldehyde-free, so you don’t have to worry about exposing your family or guests to potentially harmful chemicals. Wide loop sinuous springs that run from the front to the back of the seat guarantee your sofa won’t sag, while its foam-filled backs and pillows contour the body for extra comfort. In addition to its concealed, queen-sized spring mattress, this sleeper sofa features a super smooth rocking mechanism. Check out our other reviews of the best couches available on the market today. Traditionally designed and carefully constructed, Ashley Furniture’s Larkinhurst takes the number two spot for its timeless look and high-quality manufacturing. Upholstered with thick poly fiber, corded trim and decorative nail heads, this sleeper sofa would work well with a traditional or classic style of home décor. Built with a corner-blocked wood frame, tight back and high-resiliency foam seat cushions, this sleeper sofa is durable and supportive, but comfy enough for everyday lounging. Plus, its concealed, queen-sized innerspring mattress gives guests a comfortable place to catch their zzz’s. 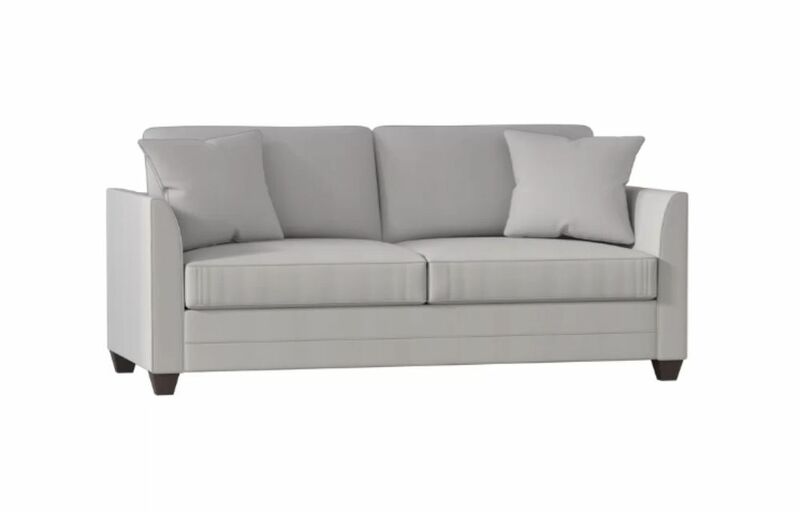 Measuring just under 7.5 feet long, this sleeper sofa is ideal for mid-sized spaces. This sleeper sofa is shipped directly from Ashley Furniture and arrives assembled, so you’ll be able to lounge (or take a nap!) as soon as it arrives on your doorstep. Have some space to spare? Check out Ashley Furniture’s Alenya sleeper sofa. Measuring seven feet long, this sleeper sofa pulls out to a queen-sized bi-fold innerspring mattress, so your guests can really stretch out. This sleeper sofa isn’t just a comfortable addition to your living room, guest room or den, either. Its clean lines and classic profile make it super stylish and super versatile; it’ll pair well with any style of home décor. Plus, it’s upholstered with a polyester-nylon blend that’s available in two neutral tones, so it’ll match any color palette, too. If you’re furnishing an apartment or just trying to find the perfect sleeper sofa for a smaller space, this pick from Ashley Furniture can fit just about anywhere. Its smaller footprint—it measures 55" x 38" x 38"—is ideal for studio apartments, smaller living rooms, office spaces or dens. And even though this sleeper is small in size, it’s big on functionality: Simply pull the supportive metal bed frame out to reveal a twin-sized memory foam mattress that can comfortably accommodate an overnight guest or two. Available in three neutral colors, this sleeper sofa is upholstered with a thick polyester-nylon blend, so it feels super soft to the touch, but will still resist rips, tears and stains. Plus, its clean lines and easy-to-match color options make it simple to pair this sofa to most décor styles and color palettes. Want to take a look at some other options? See our guide to the best sofas for small spaces. This sleeper sofa from Wrought Studio is an incredibly wallet-friendly option, whether you’re furnishing your first apartment or just redecorating on a budget. Featuring a full-sized mattress, this pick is perfectly sized for smaller spaces, like a small guest room, office, or apartment. It’s approximately 6 feet long, so you’ll save floor space, but maximize space for your guests. The couch is made of a durable linen fabric on a wooden frame. The fabric is in a dark gray color that can match various decor styles, from modern to classic. The foldable mattress is made of foam, which reviewers say is high-quality for the price. Designed with clean, simple lines and upholstered with soft, genuine leather, the Jennifer Leather Sleeper Sofa will make any room of the house look more lux—and converts to a comfy full-sized bed for your overnight guests. For additional comfort, the backs, arms and frame are padded with super thick foam stuffing. Pro tip: Leather furniture is always a smart choice, especially if you have kids, pets or spill-prone guests. It’s resilient, easy to clean and ages beautifully—but the convenience of genuine leather usually comes with a higher price tag. Although this sleeper sofa does have a higher price point, it’s worth the investment: The upholstery material is genuine leather, and the sleep-mattress is gel-filled to ensure a comfortable nights sleep. Many reviewers noted that it's so comfortable you would never know that it's a sleeper! Take a peek at some of the other best leather sofas you can buy now. 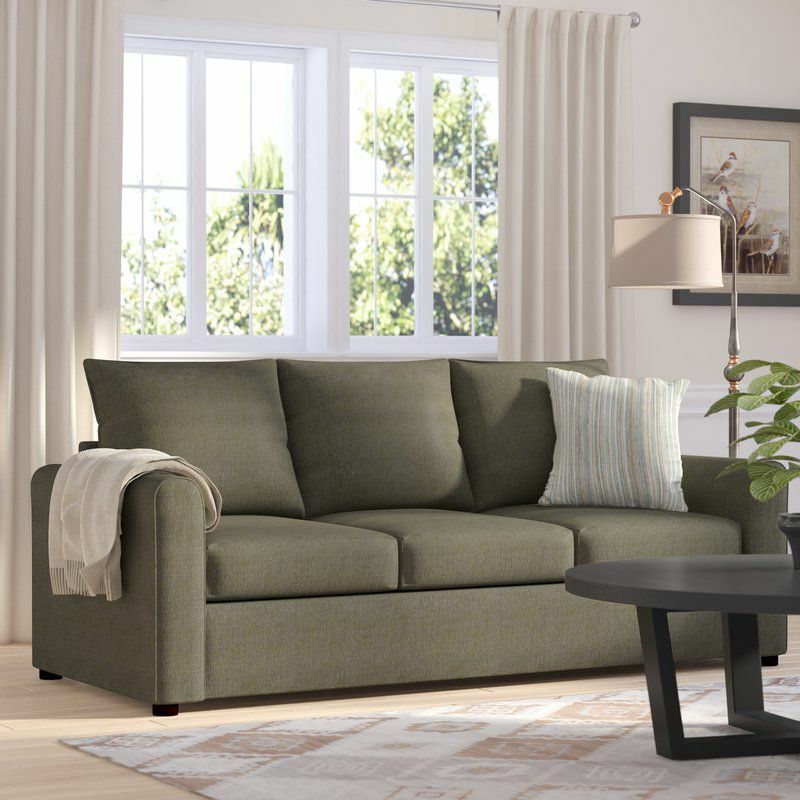 We love Wayfair’s Tynemouth Convertible Sleeper Sofa for its super-versatile, classic design and its nine color options. Plus, the material is 100% linen which will hold up well over time. That’s a huge bonus for families with kids and pets! The base is constructed of solid wood, and the cushions feel comfortable for overnight guests (albeit a bit firmer than expected). The beige and gray colors are definitely more classic, but the burgundy or bright blue will add a pop of color and a touch of whimsy to your living space. Real-life customers love this sleeper sofa because the attractive design will look gorgeous in any home. One customer even shared that her friends ooh-ed and ahh-ed the first time they saw it in her house. This sleeper sofa will help your guests snooze in style. Our reviewers spent 86 hours testing a top-rated sleeper sofa. To get the most comprehensive results possible, they assembled it at home and used it daily — for both sitting and sleeping, of course! We asked our testers to consider the most important features when using this sleeper sofa, from its size to its comfort. We've outlined the key points here so that you, too, know what to look for when shopping. Size It’s possible to find a twin- or king-sized sleeper sofa, but full or queen sizes are much more common. Before settling on a size, check how much room you have for both a couch and a fully extended sleeper. If the piece needs to be hauled up or down stairs, consider its weight, too — sleeper sofas tend to be very heavy. Comfort Spring mattresses are the most common and often the least expensive, but they can be loud and uncomfortable. (To ensure a better night’s sleep, look for 600 or more stress-relieved coils.) Some spring mattresses, however, are equipped with foam or air mattress toppers, which can increase comfort. Memory foam mattresses tend to be more expensive, but they offer more support. Construction Choose kiln-dried hardwood frames instead of metal ones, which can have uncomfortable bars. From there, opt for a sleeper sofa that lifts up and out easily, has smooth edges, and features a locking mechanism. If you’re making your final purchase in-store, test the sofa’s operating mechanisms before you buy it. One of our reviewers loved that this sleeper sofa fit perfectly in her new one-bedroom apartment: “It's not too big and therefore doesn't take over an entire room,” she explained, “but it's large enough to accommodate two people comfortably.” She also thought that the neutral grey color of the sofa went “nicely” with her black furniture and wood floors. Most importantly, according to one reviewer, the bed was “as comfortable as I’d expect a sofa bed to be.” However, one of our testers would’ve liked if the sofa’s back cushions were removable.